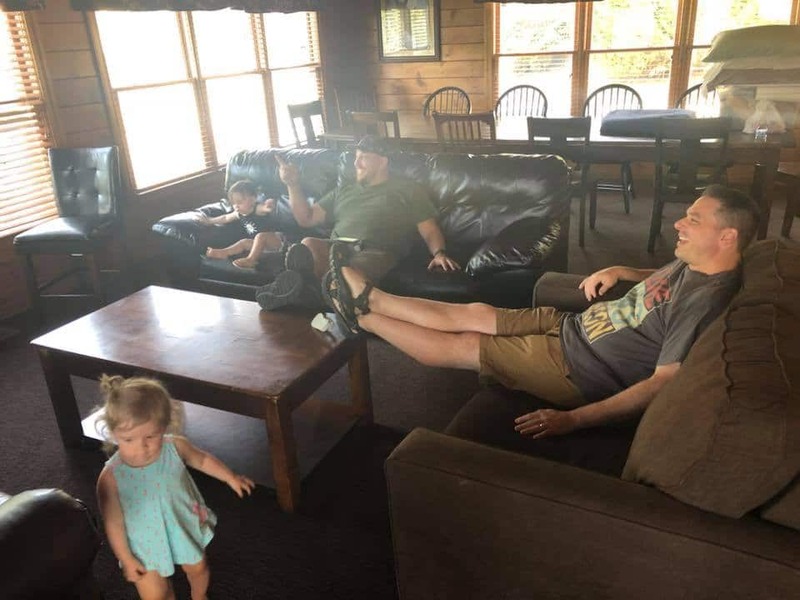 Disclosure: Gatlinburg Falls Resort hosted my family in exchange for an honest review. All text and opinions are my own. Recently, we made our third trip to Gatlinburg, TN to stay in a cabin at Gatlinburg Falls Resort, the number 1 family resort in the Smokies. 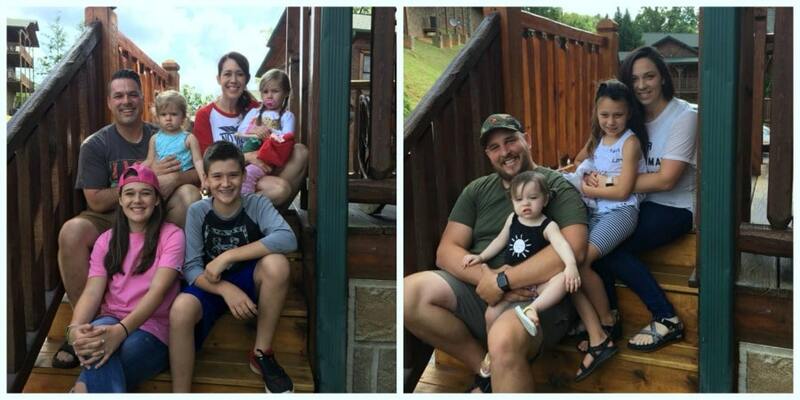 We have loved staying in a cabin with our family, but for this getaway, we invited another family to vacation with us. This was the first time in years that we have vacationed with anyone but our immediate family. We thought it might be too hard to vacation with another family since we already have four kids. Plus we were afraid that we would feel like we were intruding on their space, especially if one of our little ones didn’t sleep well or if someone got sick, which usually ends up happening at some point when we go out of town. If you have a bunch of kids, like us, I bet you understand. We asked our good friends, Josh and Lisa and their girls to come with us. Including our family, there was ten total, with four adults and six kids. We stayed in the cabin King of the Hill that was more than big enough to accommodate both of our families very comfortably. After enjoying such an incredibly fun vacation with our friends, even our kids asked if we could make it a yearly tradition. As much as we love traveling, making memories, and traditions with our family it was so much fun to include our friends with us. I’ve added several highlights below from our trip as well as a video walkthrough of our cabin. We love vacationing in Gatlinburg and Pigeon Forge. The view all around is breathtaking. 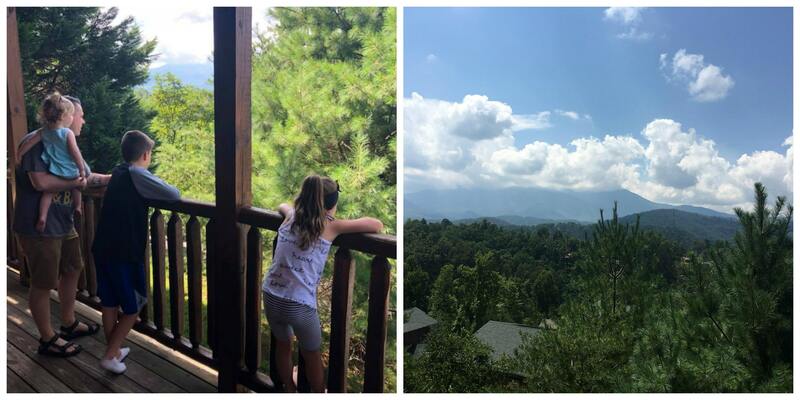 From our cabin, we had spectacular views of Mount Leconte. The game room was a huge hit for everyone, especially the big kids and the men. They spent hours down here playing games together. It included a pool table, air hockey table, various arcade games, a jukebox, and a movie theatre room. The girls had so much fun playing together. Since our big kids have two younger sisters, they love playing with little ones. It was so neat to have kids of all different ages together enjoying spending time together. Of course, as the mom and the primary picture taker, I got way more pics of the daddies and babies than us moms, but I am so glad that my hubby got to enjoy some guy time while we were away. Here is a quick video walkthrough tour I made of our cabin so that you can see how comfortable the accommodations were. We stayed in the King of the Hill, but Gatlinburg Falls has a vast selection of cabins of many different sizes. You can search right from their website to find the best cabin to fit your needs. If you are thinking about scheduling a quick getaway or vacation to the Smoky Mountains, here are 7 reasons why you should consider vacationing with friends or family at Gatlinburg Falls Resort. Economical – Have you checked out the price of hotels recently? With our family of 6, it is tough to find a hotel that fits us comfortably. 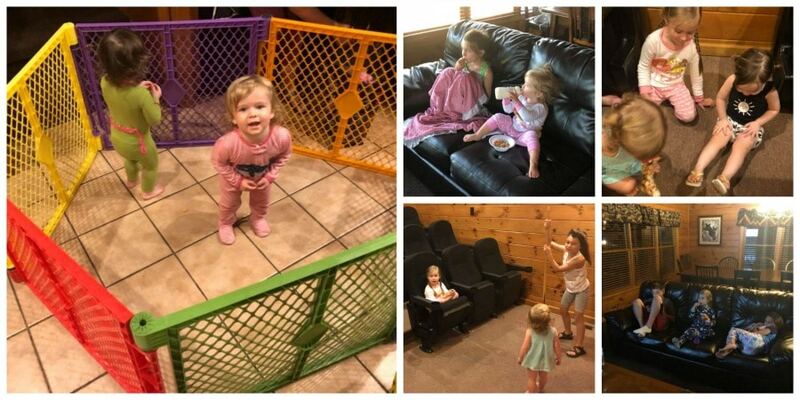 Therefore, we have loved staying in cabins at Gatlinburg Falls since they come with a fully equipped kitchen as well as a game room, media room, and a hot tub for our enjoyment. By the time you divide the cost of a cabin with two or more families, it is incredibly affordable. Also, you get more bang for your buck as we find ourselves chilling out in the cabin and spending less money on attractions and such. Save Money on Food & Enjoy Sitting Around the Table Together – Going out to eat for every meal can get very expensive. Although we didn’t necessarily cook meals on our getaway, we enjoyed a quick breakfast together and ordered pizza one evening for a late dinner. If you have little ones, like us, then you know how stressful mealtime can be at a restaurant especially if you have missed nap time. I love how big the tables were at each of the cabins that we have stayed. Families can sit around the table together comfortably. One of my favorite memories of our time away together was sitting around the table together chatting while our younger kids sat on the couch right next to us watching a movie together. Also, in our typical day to day lives, I always feel like I am rushing here and there. Being able to get up when we wanted to enjoy a leisurely breakfast together without being in a hurry for everyone to get ready and get out was such a nice change of pace. If you enjoy cooking on vacation, all of the cabins that we have stayed in at Gatlinburg Falls come with a fully equipped kitchen. Momma Needs Time with Girlfriends – Being a stay at home working homeschooling mom of 4 means I wear lots of different hats. It also means that life is full, which I genuinely love, but I don’t have a lot of time to hang out with my girlfriends. Even at church events for the entire family, my hubby and I usually find ourselves spending most of the time chasing after our littles. Staying in a cabin together with our friends afforded me time to hang out with my friend and enjoy girl time. We could sit our littles down together to play, and she and I could talk, laugh, and just hang out together. Daddy Needs Time to Hang with his Guy Friends – My hubby works so hard and rarely chooses time away to spend time with his guy friends. Last weekend, my hubby got plenty of guy time. He and our friend, Josh, got to hang out, shoot pool together, sit around the table and chat, as well as watch the babies together when us mommas needed a break. It didn’t take time away from our family, and we still got plenty of time together. It was a perfect mix of friends, family, and fun. 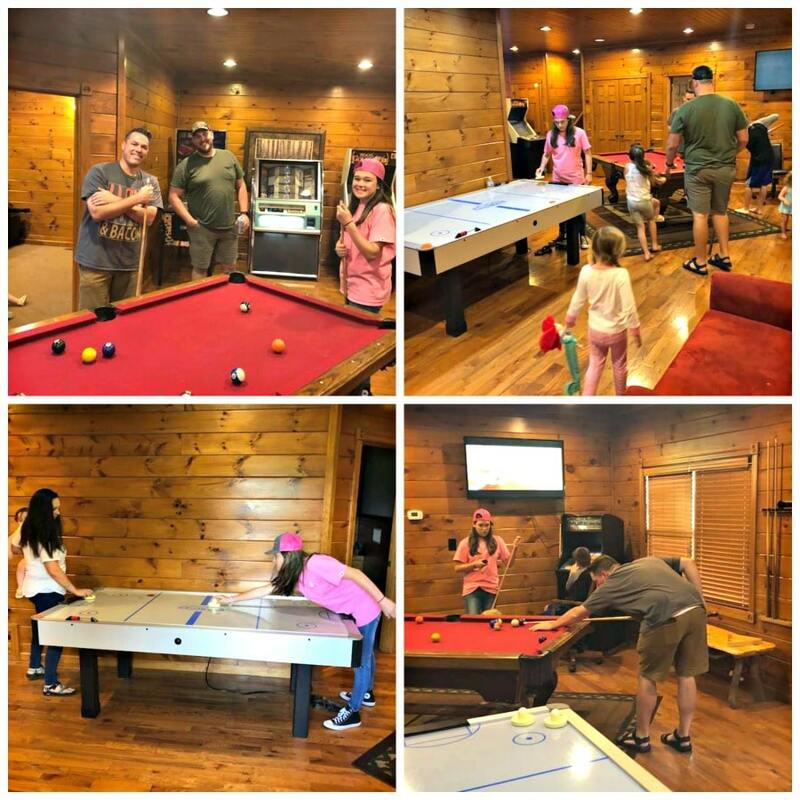 Entertainment Without Having to Leave the Cabin – The cabin we stayed in came fully equipped with TV’s in every room, DVD players, a game room complete with a pool table, air hockey, several other arcade games, a jukebox, and a hot tub. Because there was so much to do, we didn’t feel pressured to go out and find something to do. Also, it made it easier to keep the babies happy because they weren’t constantly in a stroller while we were out and about. They were able to run around and play together, watch movies, and rest when needed. There is Plenty of Privacy – The cabin we stayed in had five bedrooms, and each bedroom had a bathroom. Although we loved the time we hung out with our friends in the cabin, it was nice to be able to retreat to our own rooms at night to rest. I also didn’t have to worry about the baby waking everyone up if she woke up in the middle of the night. We all had our own space. In fact, at home, my oldest daughter shares a room with her two younger sisters. While we were at our cabin at Gatlinburg Falls Resort, she had her very own room and bathroom. Since there were three floors, we were never on top of each other. Our cabin also had three different porches off of each floor, which gave us additional opportunities for privacy as well. All six kids had plenty of room to play, and the adults could hang out as well. This was even more important our last morning when two of my kids woke up with a stomach virus. We were easily able to keep them corraled so they wouldn’t spread their germs to the rest of the crew. An even bigger bonus, they didn’t wake anyone else up when they were sick through the night. Perfect for Kids of All Ages – Together, our kids are 14, 11, 6, 3, 19 months, and 14 months; therefore they all have different needs and interests. I love that a cabin accommodated both the older kids as well as the littles. The big kids were able to stay up late, play arcade games, blast the jukebox, watch movies, and even hang out with the adults (yay! they aren’t too old), while the littles played with each other. When you have little ones, they typically need quiet and rest, otherwise, a vacation can wind up not so fun for the entire family. When you stay in a cabin, the babies can nap when needed or even go to bed. If we stayed in a hotel room, everyone would have to be quiet and rest while the babies were resting. It Takes a Village – Family time and making memories is so important to us. We also love bringing other families into our tribe as it truly takes a village to raise children. Having other role models to pour into our kids is powerful, but life is busy, and we often find ourselves going through the motions each day doing all the things we have to do. Our friends that came along with us are not only incredible influences in our big kids’ lives, but they also are treasured friends of mine and my husband. Our big kids already love our friends and their little girls, but getting to spend intentional time with them was invaluable. Being able to stay together in a cabin gave us extra opportunities to bond as we relaxed and just hung out together. When you have a plate full of life day to day, it is hard to enjoy the moment at times. I’m so glad we were able to get away with our friends and have such a fantastic weekend at Gatlinburg Falls Resort. The only downside is that it was over too soon. If you are in a rut, perhaps a few of these ideas will be helpful in planning your next getaway with friends and family. Of course, there are so many other options. My family looks for any excuse for quick vacations as we feel like it creates memories and traditions that are bonding and strengthen our family. Throughout the year, we choose to skip buying “things” as often as possible and instead invest in time together. 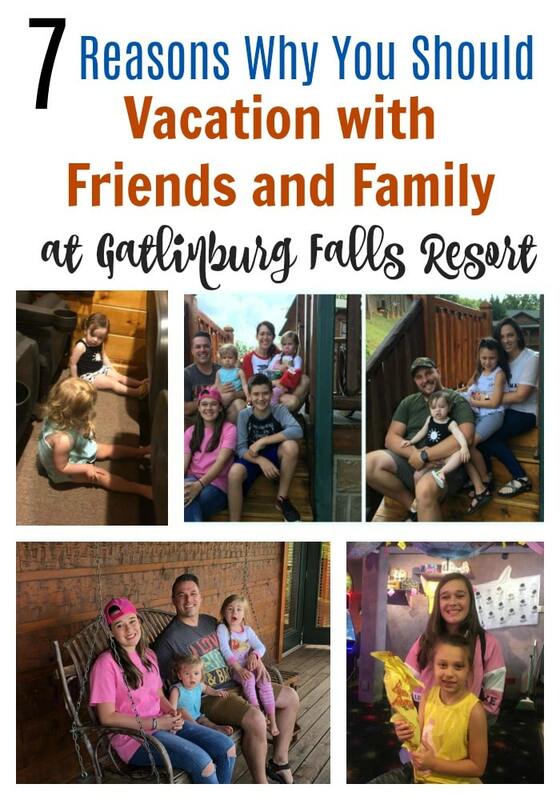 Now, we see the importance of vacationing with friends and family and hope to make this a yearly tradition at Gatlinburg Falls Resort.